Rabbit polyclonal Argonaute-2 antibody. Validated in WB, ICC/IF and tested in Drosophila melanogaster. Cited in 8 publication(s). Independently reviewed in 4 review(s). Synthetic peptide corresponding to Drosophila melanogaster Argonaute-2 aa 550-650 conjugated to keyhole limpet haemocyanin. This antibody gave a positive result in WB on Drosophila lysate. Please note the immunogen for this antibody has no sequence alignment to human dIFC2. When tested in human, non-specific binding is observed. Our Abpromise guarantee covers the use of ab5072 in the following tested applications. WB 1/500 - 1/1000. Detects a band of approximately 55, 95 kDa (predicted molecular weight: 106 kDa). Detects a band of approximately 55 + 95 kDa (predicted molecular weight: 106 kDa). Swissprot suggests Ago 2 may have 50kDa form. Not yet tested in other applications. Optimal dilutions/concentrations should be determined by the end user. Required for RNA-mediated gene silencing (RNAi) by the RNA-induced silencing complex (RISC). The 'minimal RISC' appears to include EIF2C2/AGO2 bound to a short guide RNA such as a microRNA (miRNA) or short interfering RNA (siRNA). These guide RNAs direct RISC to complementary mRNAs that are targets for RISC-mediated gene silencing. The precise mechanism of gene silencing depends on the degree of complementarity between the miRNA or siRNA and its target. Binding of RISC to a perfectly complementary mRNA generally results in silencing due to endonucleolytic cleavage of the mRNA specifically by EIF2C2/AGO2. Binding of RISC to a partially complementary mRNA results in silencing through inhibition of translation, and this is independent of endonuclease activity. May inhibit translation initiation by binding to the 7-methylguanosine cap, thereby preventing the recruitment of the translation initiation factor eIF4-E. May also inhibit translation initiation via interaction with EIF6, which itself binds to the 60S ribosomal subunit and prevents its association with the 40S ribosomal subunit. The inhibition of translational initiation leads to the accumulation of the affected mRNA in cytoplasmic processing bodies (P-bodies), where mRNA degradation may subsequently occur. In some cases RISC-mediated translational repression is also observed for miRNAs that perfectly match the 3' untranslated region (3'-UTR). Can also upregulate the translation of specific mRNAs under certain growth conditions. Binds to the AU element of the 3'-UTR of the TNF (TNF-alpha) mRNA and upregulates translation under conditions of serum starvation. Also required for transcriptional gene silencing (TGS), in which short RNAs known as antigene RNAs or agRNAs direct the transcriptional repression of complementary promoter regions. The Piwi domain may perform RNA cleavage by a mechanism similar to that of RNase H. However while RNase H utilizes a triad of Asp-Asp-Glu (DDE) for metal ion coordination, this protein appears to utilize a triad of Asp-Asp-His (DDH). Hydroxylated. 4-hydroxylation appears to enhance protein stability but is not required for miRNA-binding or endonuclease activity. Cytoplasm > P-body. Nucleus. Translational repression of mRNAs results in their recruitment to P-bodies. Translocation to the nucleus requires IMP8. Additional bands at: 120 kDa, 19 kDa, 50 kDa, 65 kDa. We are unsure as to the identity of these extra bands. This blot was produced using a 4-12% Bis-tris gel under the MOPS buffer system. The gel was run at 200V for 50 minutes before being transferred onto a Nitrocellulose membrane at 30V for 70 minutes. The membrane was then blocked for an hour using 2% Bovine Serum Albumin before being incubated with ab5072 overnight at 4°C. Antibody binding was detected using an anti-rabbit antibody conjugated to HRP, and visualised using ECL development solution ab133406. ab5072 staining Ago2 / eIF2C2 (green) in fruit fly (Drosophilia melanogaster) OSS cells by ICC/IF (Immunocytochemistry/immunofluorescence). Cells were fixed with formaldehyde, permeabilized with 0.2% Tween and blocked with 1% BSA for 1 hour at 22°C. Samples were incubated with primary antibody (1/200) for 16 hours at 4°C. An Alexa Fluor® 488-conjugated donkey anti-rabbit IgG monoclonal (1/5000) was used as the secondary antibody. 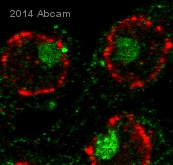 ab24609 was used to stain Nuclear Pore Complex Proteins (red). Rabbit polyclonal to Ago2 (ab5072) at 1/500 on Drosophila lysate (20ug). Detects a band of approximately 55 + 95 kDa (predicted molecular weight: 106 kDa). Swissprot suggests Ago 2 may have 50kDa form. 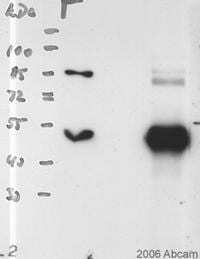 Secondary antibody - Goat polyclonal to rabbit IgG (HRP) - ab6721. Swissprot suggests Ago 2 may have 50kDa form. Publishing research using ab5072? Please let us know so that we can cite the reference in this datasheet. I am interested in the fluorochrome conjugated primary antibodies for Anti-ElF2C2 (hAgo2) mAb. Is there any abcam product that you can recommend? Unfortunately, we do not have any antibodies against Anti-ElF2C2 (hAgo2) which are directly conjugated to a fluorochrome available in our catalog. Thank you very much for your interest in ab5072. To our knowledge, ab5072 has not been tested in IP or in a pull down assay. We do not use pull down assay as a application on our datasheets. But an antibody that is suitable for IP should also be suitbale for pull down assays. Therefore, I can offer a discount off a future purchase if you buy ab5072 now, test it in IP and submit feedback to us in the form of an Abreview. It doesn’t matter whether the Abreview is positive or negative, we would just really like to receive your feedback. The discount would be to the value of ab5072 off a future order. 1. Reply to this e-mail to let me know that you would like to proceed and test ab5072 in IP. I will then send a discount code. This code must be issued before purchasing ab5072 so please wait for my reply before ordering. 2. Purchase ab5072 either by phone, fax, or online (www.abcam.com). 3. Test it in IP. 5. After the review is submitted to us, the discount code becomes active. Simply place your new order by phone, fax, or on the web and mention the discount code. The discount can be redeemed for anyproduct ordered and the discount code is valid for 4 months after issue. We are always pleased to obtain feedback about our products and any information is greatly appreciated! Even if ab5072 turns out to be unsuitable for IP, you will still receive the discount on your next purchase after your Abreview has been submitted. Thank you for your enquiry. I sincerely apologize for the error. We just received information regarding the immunogen sequence for this antibody. On investigation by our laboratory, it seems that it does not have any alignment to the human protein. Therefore, this antibody is not expected to react with human samples and therefore, the datasheet has been updated to show the changes. We also received a review from a customer who managed to obtain results with human samples but after confirming the sequence alignment, we deduced that the results obtain by the customer was probably due to non-specific binding. I am unsure about the findings of Schneider MD et al (2006) but our information was taken from SwissProt database. If you have any questions regarding the findings from the authors, I would suggest that you contact them for further details. I am truly sorry that we had a mistake on our datasheet and I am more than happy to offer you a free replacement product of your choice that has the same value as this ab5072, or a refund. Please let me know which method you would prefer and please confirm your purchase details (purchase order number, shipping address/purchasing agent), so that I can immediately issue you the replacement or refund. I look forward to hearing from you again in order to resolve the matter. I am using ab5072 (Rabbit polyclonal to Ago2/eIF2C2) for some assays and wanted to order a good control antibody from you. It would have to be an affinity purified Rabbit polyclonal antibody, preferably (though I guess not necessarily) against a Drosophila target. Since it is a control, it should not target any components of the RNAi machinery. Something like a transcription factor would be ideal since I am looking at protein expression at a time when Drosophila are transcriptionally silent. I was hoping you could suggest some candidates from your catalogue. The concentration would have to be at least 0.5 mg/mL. Thank you! Thank you for your enquiry. Assuming that you are interested in an antibody to control for non-specific binding I would like to recommend that you use an affinity purified rabbit polyclonal antibody against an irrelevant target such as one of the epitope tags. These are obviously foreign to Drosophila and will serve to highlight any non-specificity in your experiments. For example: V5 tag antibody - ChIP Grade (ab15828) This is an immunogen affinity purified sera and supplied as a range: 0.20 - 0.50 mg/ml I hope this information helps, please do not hesitate to contact us if you need any more advice or information.